Spain’s tiny far-right party Vox, with its tough line against immigration and Catalan independence, is starting to make waves and on Sunday could win seats in a regional election for the first time. Polls put the Socialists (PSOE) ahead in their traditional southern stronghold of Andalusia, which they have ruled for the past 36 years. But Vox appears to be on course to win up to five seats in the 109-seat regional parliament, polls say. 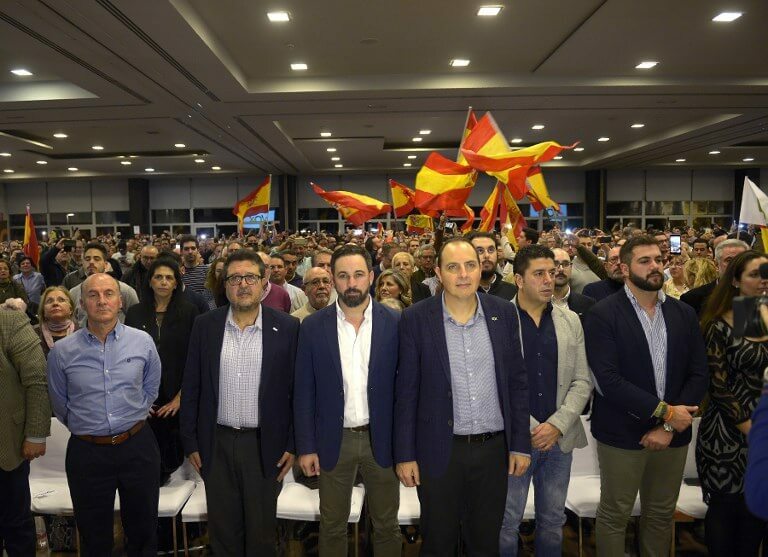 ‘The goal of these Andalusian elections is to obtain an important representation … so as to play a deciding role in the formation of the next government,’ Vox leader Santiago Abascal told the AFP news agency. The 42-year-old former member of the conservative People’s Party (PP) was speaking on the sidelines of a campaign rally for his five-year-old party in the southern city of Granada. Abascal himself comes from the northern Basque region. But he hopes a breakthrough in Andalusia will serve as a springboard for wins in European Parliament elections in May – and at an early general election in Spain, widely expected in 2019. If Vox did win a seat in the next general election, it would be the first time a far-right party had a presence in Spain’s lower house of parliament since 1982. ‘The Reconquista starts in Andalusian lands,’ Vox wrote on Twitter alongside a video of Abascal riding a horse. The Reconquista reference was to the long series of medieval wars waged to recapture territory from the Muslims who occupied most of the Iberian Peninsula in the early 8th century. Andalusia is Spain’s most populous region and has one of the country’s highest unemployment rates. It has also become one of the main entry points for migrants into Europe. Like Italy’s far-right Interior Minister Matteo Salvini, Abascal accuses those rights groups trying to save migrants at sea of ‘acting like taxis’ and has vowed to end illegal immigration. Vox also wants to ban regional pro-independence parties and repeal a law against domestic violence, which it argues has gone too far. It also wants to tighten the abortion laws. ‘People are tired of political correctness,’ Jose Miguel Camacho, a 34-year-old civil servant, told AFP at the Vox rally in Granada. The event attracted many young men, such as 18-year-old Alfonso Pueyo who wants to join the army. ‘In this movement we don’t have to be afraid to say what we feel and want,’ said Pueyo, who called for a ‘regeneration of society’ to defend its ‘Judeo-Christian and Western’ origins. Vox also appeals to voters disappointed with Spain’s traditional parties. 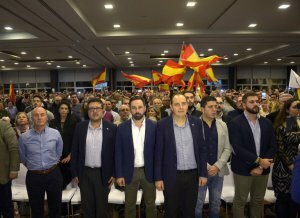 ‘I voted for the Socialists, I voted for the Popular Party,’ said Juan Quesada, a civil servant with a red and yellow Spanish flag tied around his neck. Under the Socialists, who have governed Spain since June, ‘things are getting worse’, he said. As for the Popular Party, he said, he did not see them fighting for Spaniards. Abascal has consulted with US President Donald Trump’s former political strategist, Steve Bannon. Voters, he says, are ‘tired of progressivism’ and ‘of a lack of a reaction on the part of the right across Europe’. Far-right parties in the rest of Europe have made gains mainly due to their anti-EU and anti-immigration positions. But Vox owes its growing support to factors specific to Spain, such as its opposition to last year’s failed independence bid by Catalonia, said Jose Pablo Ferrandiz of polling firm Metroscopia. Another factor was the ‘lack of leadership’ in the main opposition PP, which under its new leader Pablo Casado has failed to take off in the polls, he added. For years, the PP, founded in 1977 by members of recently deceased dictator Francisco Franco’s regime among others, concentrated the votes of conservatives, including those on the far-right, said Ferrandiz. But it had lost this capacity, he added. Carmen Gonzalez Enriquez of Spanish think tank Elcano Royal Institute nevertheless predicted Vox would ‘remain a minority party’ because anti-immigrant sentiment was not strong in Spain. ‘Few people see a cause and effect link, like Vox, between high unemployment and the fact that there a lot of immigrants,’ she argued.